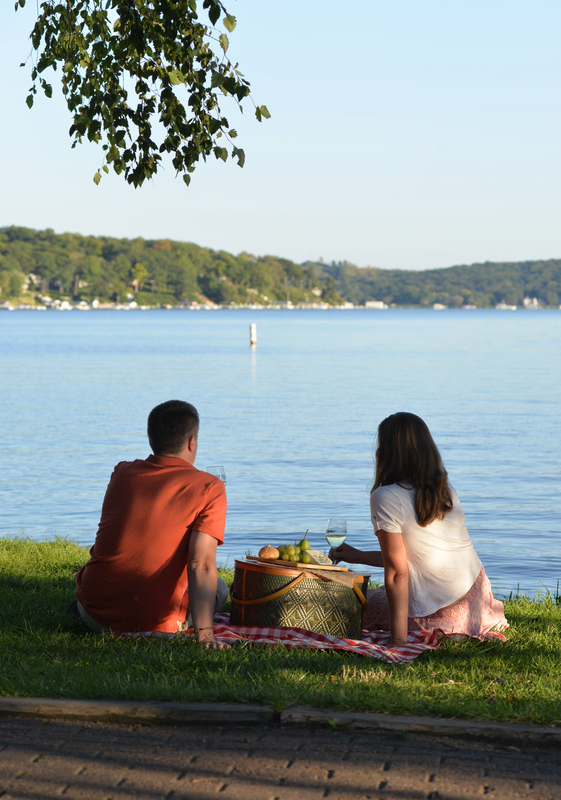 Romantic ideas throughout the Lake Geneva area & beyond…dinners, date nights, romantic stays, and more! Whether you’re celebrating a special occasion or simply wanting to spice up an ordinary weekend, Walworth County has many unique attractions for an unforgettable time out! Here are FIVE unique ideas to take that special someone on in the Lake Geneva area. Take your date to the newest attraction in Lake Geneva: the Tristan Crist Magic Theatre. Illusionist Tristan Crist promises to deliver an incredible evening of laughs, jaw-dropping illusions and gut-wrenching escapes! There is no doubt that this magical evening will leave you and your date mystified by the performance and wanting to come back for more. Surprise your date with a sunrise hot air balloon ride with the Lake Geneva Balloon Company. Glide over the Geneva Lakes area and take in the stunning sights from a bird’s eye view. Not a morning person? No worries, they also have flights 2.5 hours before sunset. Each one-hour flight ends with a delightful champagne toast making this an adventurous, yet romantic, date idea. If you’re looking for an unusual place to take your date out to dinner, then the East Troy Electric Railroad is the perfect place for you and yours. Enjoy a delicious dinner on the train as it makes a leisurely trip to Phantom Lake, pauses on the shoreline, and then heads to Indianhead Park. Savor a sweet dessert and after dinner drinks on the return trip. Dinner trains are limited and only run a few times each year, so make your reservations early! This unconventional restaurant will certainly be a date night to remember. 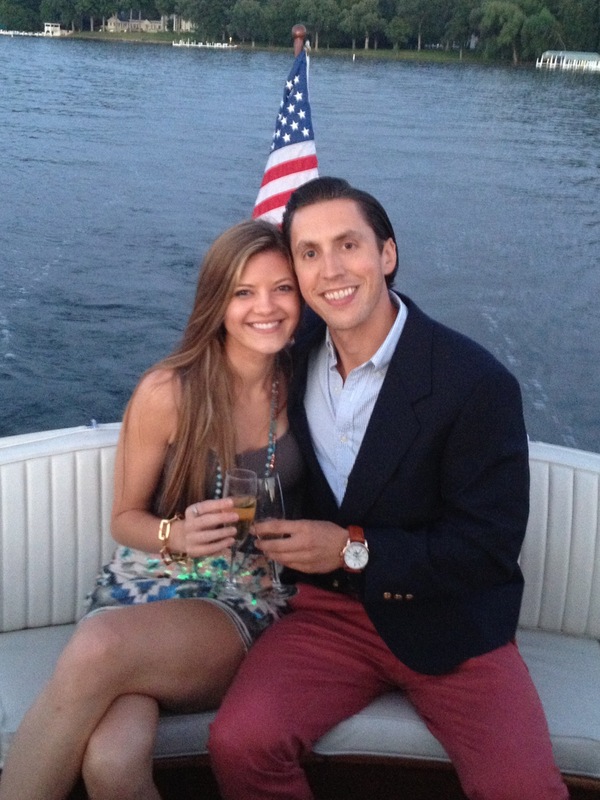 Sit back and enjoy the ride with a Lake Geneva Cruise Line Sunset Dinner Tour, aboard the Grand Belle of Geneva. A delectable meal of Tenderloin Medallions, Chicken Marsala and Shrimp Scampi will be served on the boat while touring Geneva Lake. Your romantic dinner will be complete as you view the stunning mansions along the lake shore and marvel at the brilliant setting sun. Intrigue your date with a night of history, mystery and suspense at a Murder Mystery Cocktail Party at the historic Baker House. It will be an entertaining evening of mock murder and faux fatalities in a real-life version of CLUE. Every engagement story is special – there’s no denying that. Whether it’s a simple at-home proposal or written in the sky with a plane, that moment has sentimental value to every couple. 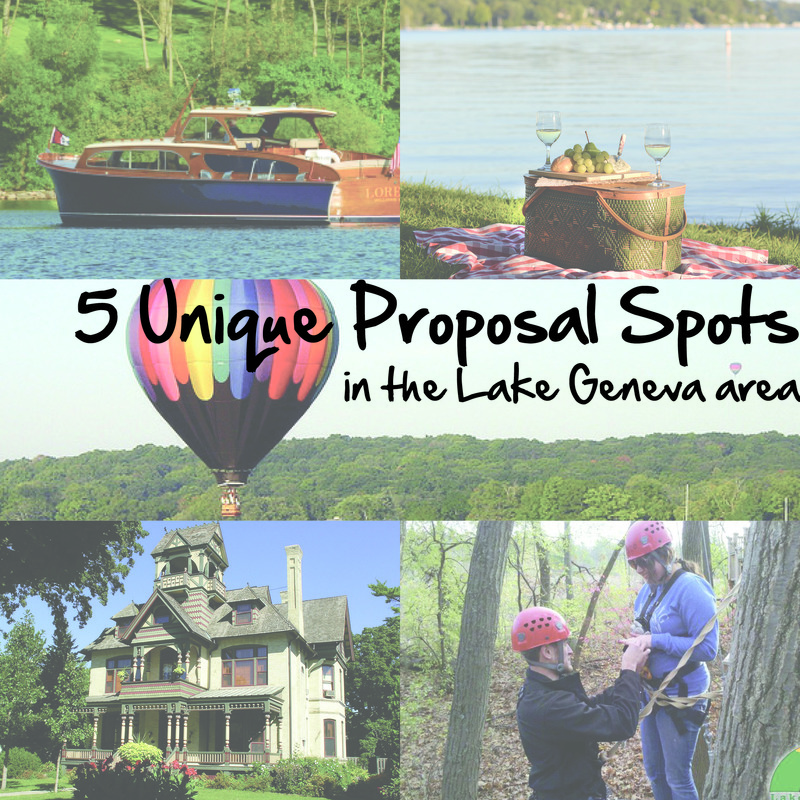 That being said…we’ve looked all around our beautiful area and come up with a sampling (five) of the most unique places/ways to propose in the Lake Geneva area! Zip lining at the Lake Geneva Canopy Tours. 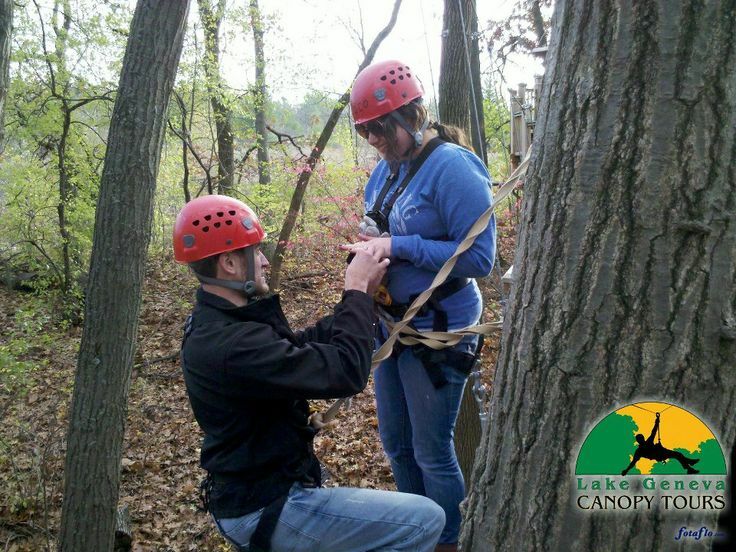 For the adventurous couple, this is a great place to get engaged (just don’t drop the ring)! 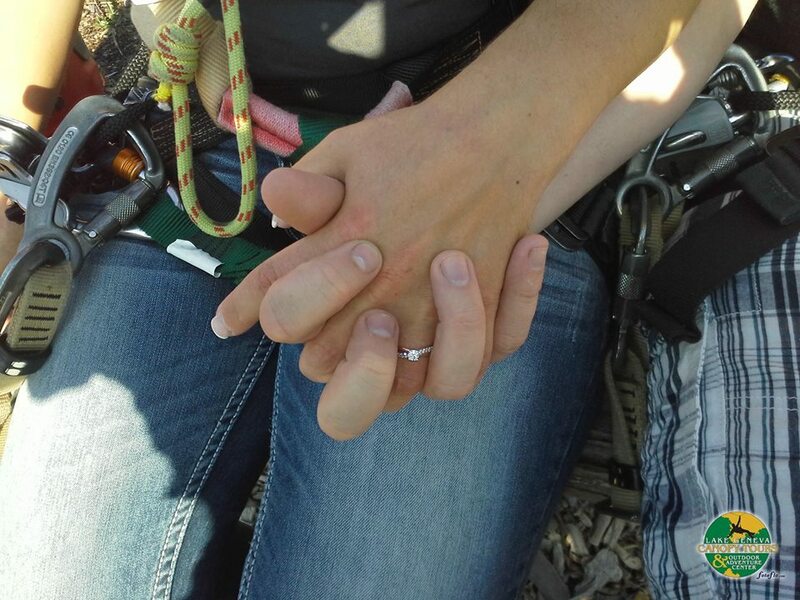 How cool would it be to zip their eight zip lines and reach that final platform at sunset, only to find a romantic spot all set up, complete with a proposal on one knee?! From the tower at Allyn Mansion Bed & Breakfast. 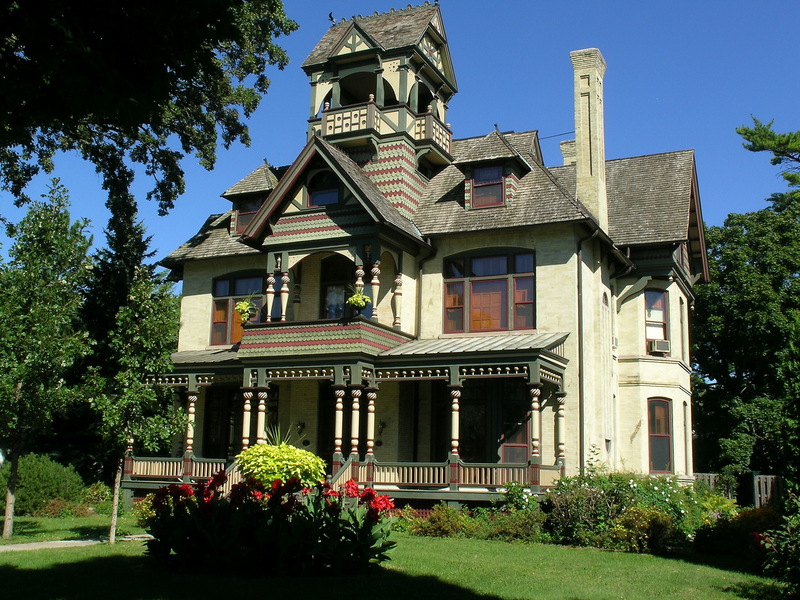 This historic mansion just reopened in downtown Delavan as a bed & breakfast, and it is beautiful inside and out! The bed & breakfast owners are hoping to add a new option (exclusive for inn guests) of dining/champagne in their tower. The tower is accessible from a room on their third floor, with a winding staircase leading the way. The view from this tower is unbeatable – and would be especially great in the autumn. In a hot air balloon with Lake Geneva Balloon Company. 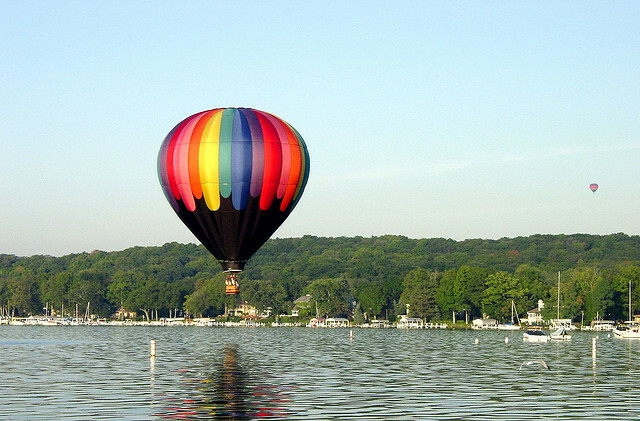 Take in the gorgeous landscape of the Lake Geneva area in this scenic hot air balloon ride. Their champagne flight is especially perfect for a proposal, as it allows for “plenty of celebration.” Their balloon flights occur at sunrise or sunset…either time will provide for a memorable view! On a private boat ride for two with Lake Geneva Cruise Line. In addition to scenic public cruises around the lake, the Lake Geneva Cruise Line offers intimate parties & boat rentals aboard a number of their boats. We especially love the Lorelei, a 41′ cabin cruiser. This wooden beauty is great for a romantic cruise for two along the shores of Geneva Lake. Make a stop at one of the local beaches or restaurants and make an entire evening out of it! Along the shore path on Geneva Lake. This option is free to everyone and unique to the area, as there isn’t another full-lake shore path like it in the United States! There are many scenic spots along the path for visitors to stop for a picnic. While you’re enjoying the view, pop the question! You don’t have to travel to Wisconsin’s Northwoods to enjoy a true supper club experience. Right here in Walworth County, you’ll find a number of choices that evoke the charm, ambiance and nostalgia of these family-friendly dining establishments that have welcomed a loyal following for generations. 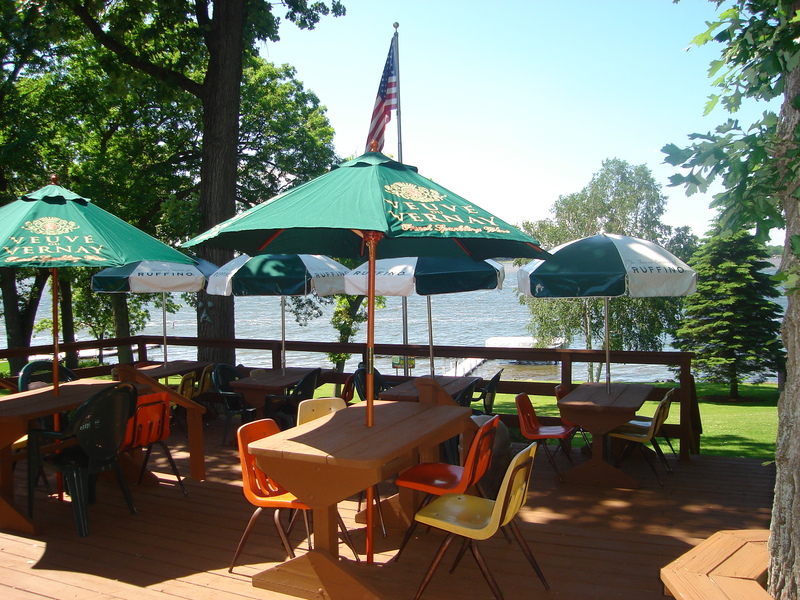 If you’re looking for a lake view while you dine, visit The Village Supper Club on Delavan Lake, situated so you can enjoy a beautiful sunset over gleaming lake waters. The restaurant offers outdoor seating plus a private pier to make arriving by boat an option. Family owned for over 40 years, The Village specializes in American and Italian cuisine and prides itself on homemade menu items made from only the freshest ingredients. 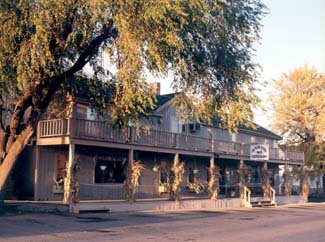 Located between Delavan and Whitewater is the historic Duck Inn. Once a speak-easy during prohibition, today this restaurant conjures up the best of the Wisconsin supper club experience with its expansive oak bar, multiple dining rooms, floor-to-ceiling fireplace and casual fine dining. Another supper club with a rich past is the Ye Olde Hotel Bar & Restaurant in Lyons, located between Lake Geneva and Burlington. Built in 1860, Ye Olde Hotel was among the first structures in the newly formed village of Lyons, and it was said to be frequented by cattle salesmen traveling from Chicago to this small farming community. Today the restaurant is decorated with artifacts and photos of the town’s past and is known for its great hospitality, tasty treats, dinner, drinks and desserts. Whether you’re looking for that Friday fish fry, rack of ribs, perfectly cooked filet, or a juicy burger, chances are you’ll find it at a Walworth County supper club, along with the traditional relish tray and of course, a brandy Old Fashioned. 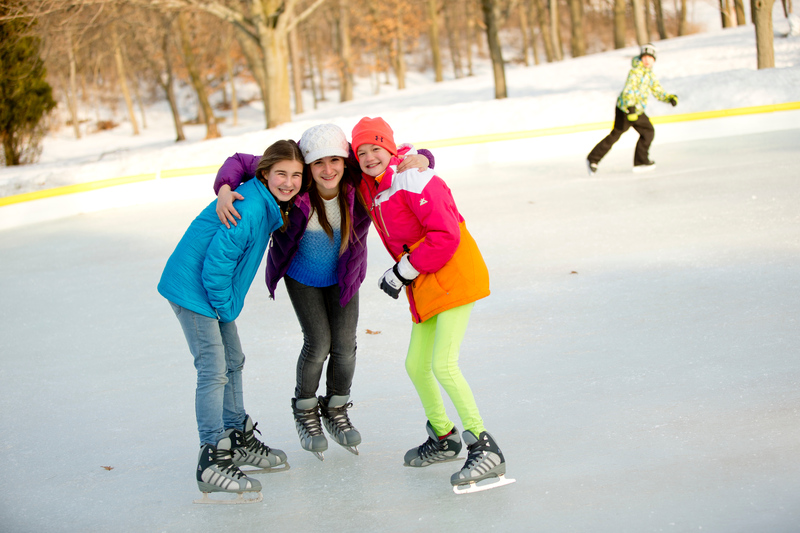 The Lake Geneva area is full of many great winter activities – including well-maintained skating rinks throughout the county! Public skating available at The Abbey rink, located on the Harbor Patio. Complimentary skate rental for resort guests; $2/pair for non-resort guests. Skating is weather dependant and will be open for skating whenever the air temperatures and ice conditions are conducive. Fully lit outdoor rink available to public and resort guests. Hot chocolate and other concessions available. Rentals available for $5. Public skating at the ice skating rink located under the outdoor Pavilion near the Golf Shop. Non-Resort guests may use the rink Monday-Thursday only. Resort guests may skate free with their own skates, or rental charges apply. Non-Resort guests can skate for $5 with their own skates or may rent skates from the Golf Shop. Rentals available $8/first hour + $3/additional hour. Public skating available on the frozen Delavan Lake. Skate rentals available for rent – $5 for adults, $3 for children. Open to resort AND non-resort guests! Rink is free to the public; bring your own skates. The park is located north of Walworth Avenue, between Terrace Street & Richmond Road along Lake Comus. The park offers ice skating on a limited basis, on certain dates. In addition to cross-country ski/walking trails and a sledding hill, this park offers an ice skating area. For year-round fun & to access our Events Calendar, visit our website. Do you have something to add to the list? Let us know! Comment below with your favorite winter activity or ice skating location.